I’d been locked away in the house for a few weeks and remembered consistently eyeballing Dimond Slice every time I’ve gone past it on the bus. Always trying to eat in a healthy manner, I was attracted to the elegant signage and the fact that it serves vegetarian food. I’ve been imagining big chunks of tomatoes and the like. It’s also relatively new so I decided Monday, June 11th, was the day that I would explore the Dimond District and end my exploration at Dimond Slice. For a while I’ve been trying to obtain an African wardrobe, making African Retail Tradees my first stop. It turns out they can only fulfill all of one’s oil needs. They have few clothes and other African products. A 7 Eleven is in a prominent location up the street. A small post office, then a couple of doors down from Little Caesars Pizza, you can get a vegan sandwich on at The Vegan Hub, building it any way you’d like for $8.99. 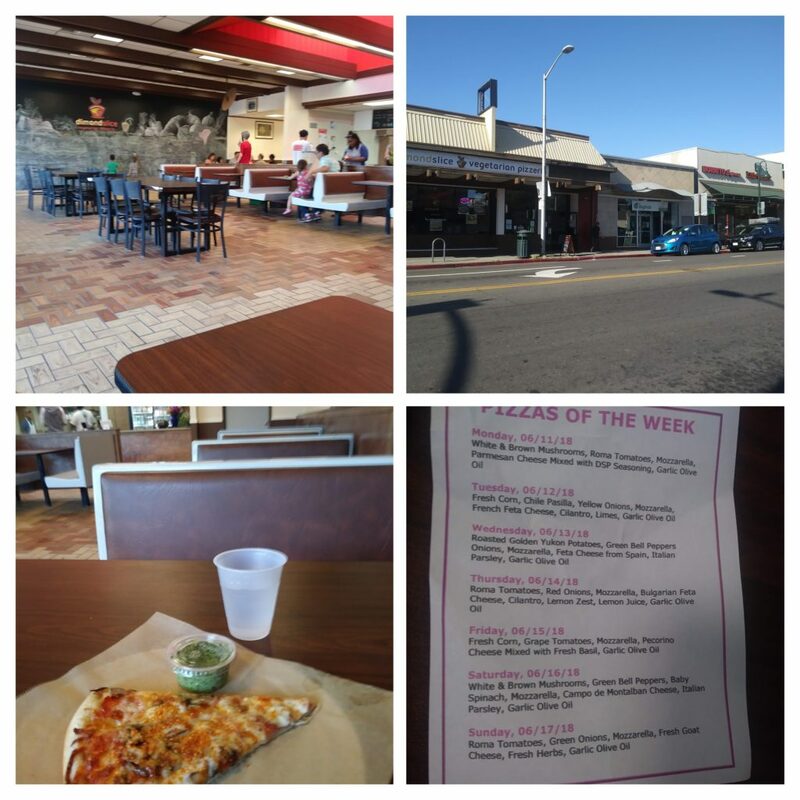 Across the street, you can obtain Indian spices and food at Tazah Market and across from it, Cybelle’s Pizza is always advertising combo deals. There are a couple of banks, Wells Fargo and Bank of America. With my love for the outdoors and that cool California breeze, I noticed the outside seating at the Hive Coffee Shop and at 1/4 Giant Burgers. You can get Mexican food at Ole Ole! and two other Mexican restaurants and there are cuisine eateries for all of your taste buds — Vietnamese and Chinese food. I love Indian food and can’t wait to try Shaan North and South Indian Cuisine’s All You Can Eat buffet lunch. Diamond Cafe is next to it, with Southern Cafe near. There’s a Subway, La Farine Bread Shop, and a meat shop. Farmer Joe’s Marketplace was busy and CVS is huge and had air conditioning. A commuter parking lot sits across the street from them, near the 580 ramp. 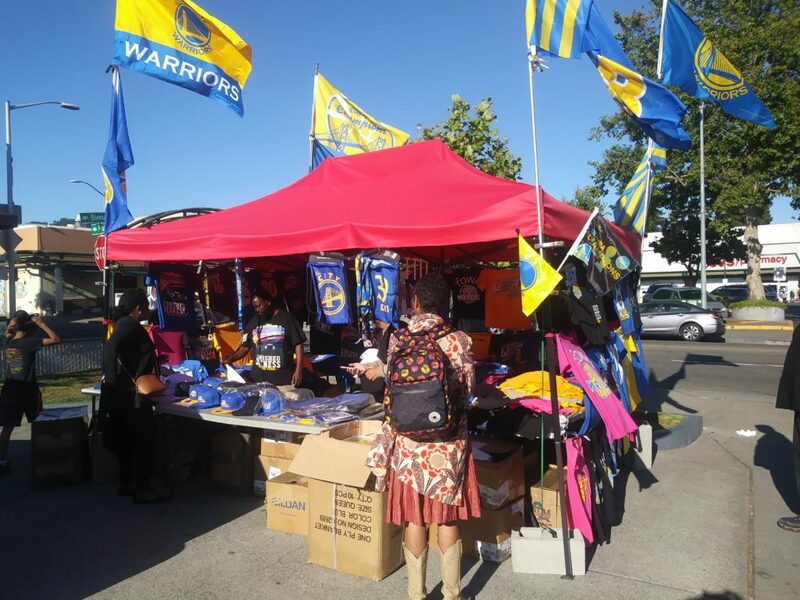 Next to a Shell Gas Station, a vendor was selling WARRIORS t-shirts. I thought that I had shopped at all the Safeway’s at one point or another, however, I’ve never been to the Safeway located across the street from the library. It has a Redbox for those of you, like me, who try to remember a location when you want to pick up a DVD. Or maybe you’re one of those people who look on your phone for everything. Either way is good. 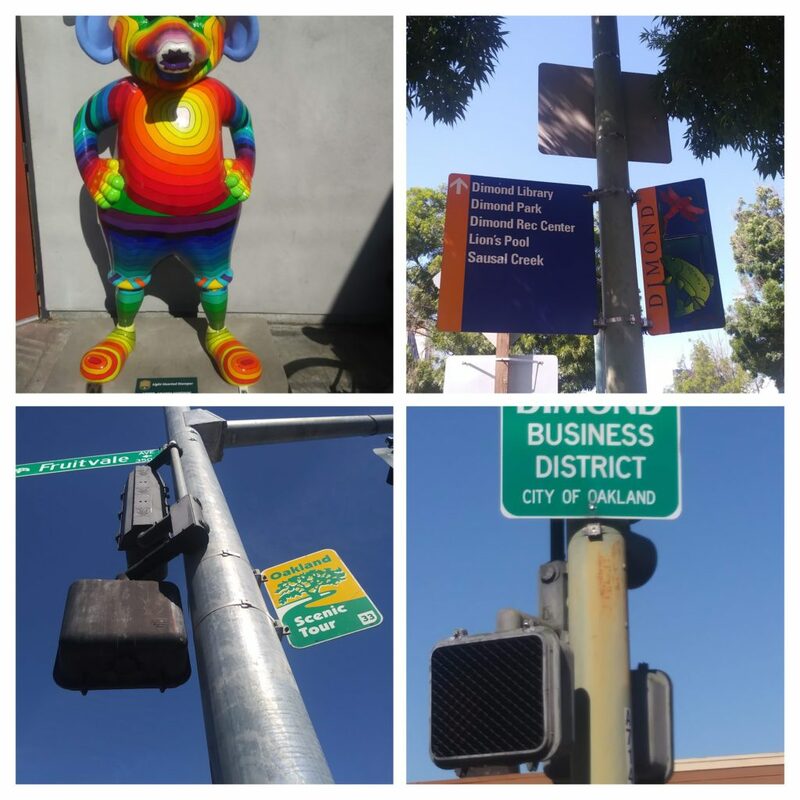 Oakland Montessori School and a property management company are located across the street from Safeway. An Italian water ice store is down the street, along with Hui Yan Fashion where you can obtain shopping carts for $21-22. The Mailbox and Copy Cat are also in the Dimond. Like every neighborhood, there’s a State Farm Insurance and a Metro PCS office. There’s an 1HR cleaners and a foot, eye and skin clinic, plus Kanna Medical Dispensary. There are two tax service businesses, a Ma and Pa store and a Jackson & Hewitt tax preparation office. There are a couple of barber shops, hair salons, naileries and convenient market stores, and a huge beauty supply store. Paws and Claws Pet Food Store & Grooming Spa is small but it should be able to fulfill your pet’s needs. There was a sign that stated wheatgrass, which I eat, is also good for indoor cats, because they don’t have access to outdoor grass and vegetation. Club 2101 located at 2101 MacArthur, appears to be a popping spot and is open 6 a.m. to 2 a.m. Soons Lounge looks good for darts and pool. 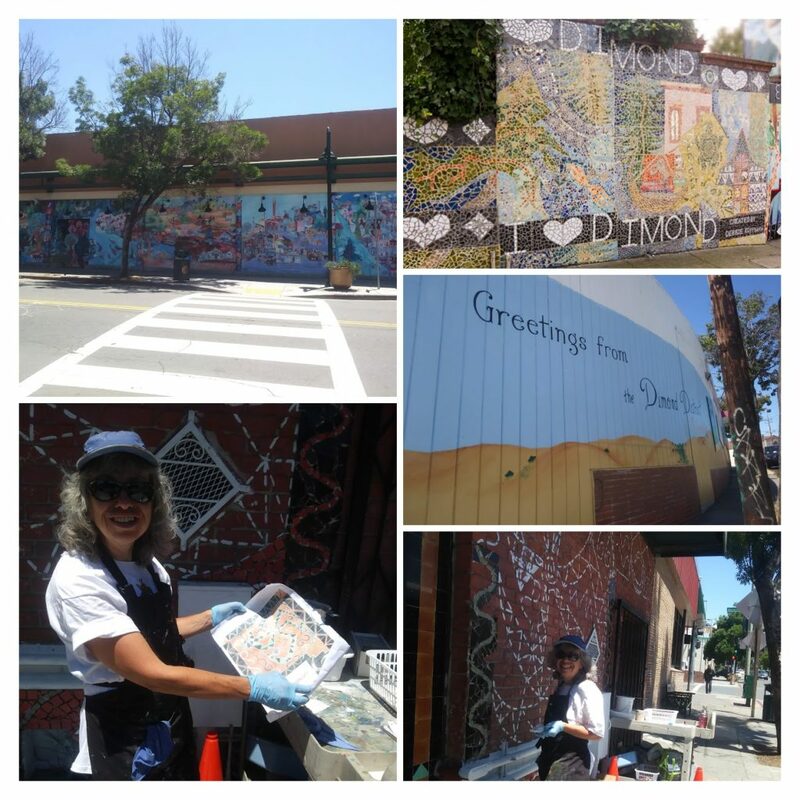 I met Debbie Koppman who was creating her newest glass mural on it. Acumen Consulting, on the corner of MacArthur and Excelsior, the end of the district in that direction, isn’t the only business in the building, which includes the Hair Mechanics and other companies. Across from it was the Altenheim senior community with great looking grounds! Oaklandish, Sprint and the library were closed. I had read a tweet from the library announcing that all branches were going to be closed for the Warriors parade and I thought that was very spiritual, but I wondered why the others were closed. Peeping through the windows, it didn’t appear that they were closing permanently. One and a half blocks up from the businesses is Dimond Park. It has a tennis court, a playground area and trails. A little farther up the street on Coolidge is Oakland Strength Factory, Alpha TV and Electronic services; Easttown advertises that it has the coldest beer in town. I chose the sunniest of days to go strolling; merchants were in shorts. My impression of the Dimond District is that it seems like a quick run-grab and go, or maybe lunch/dinner kind of area. It wasn’t walk-friendly or quaint. However, there were bike markers in the street and AC Transit has several bus lines running through it. Finally, hot and tired, I arrived at Dimond Slice. There were no lines and it wasn’t crowded. I ordered the Pizza of the Day, for they only make one specialty pizza a day and the menu changes weekly. I was approached immediately as I perused the entire menu and saw that the prices ranged from $1-23. I chatted with the counter server about the salads that are listed as small but appeared large through the glass refrigerator, for just $3.50. He was mannerly, suggesting that I try pesto sauce with my slice. It turned out to be a good idea, with the hint of cilantro – amazing. The pizza was well made with fresh ingredients. After my hike, I was grateful for the free tap water that was in a container on a table with the condiments. I sat by the door that brought in the welcoming cool air. I chatted more with the young man as he was changing the trash bags. I learned that the restaurant is owned by his father, a Jamaican, who has lived in Oakland for over 30 years. The ingredients are listed on the menu and the next day, they were having corn on the specialty pizza, and later on in the week, potatoes. I planned to grab a slice each day for the rest of the week.